Here at Blue Stingray, we use Odoo reports for total process visibility. Chances are, you can relate. Whether you are a CEO, a manager, or an employee, you probably rely on some form of reporting to measure progress and chart new paths forward. In the same way goals help us understand what we want to achieve and how to get there, reports help us see where our efforts stand in the overall picture. Depending on the software applications you use, however, generating reports can be tricky. Spreadsheet users find this task daunting and time-consuming. That can lead to human error and inaccurate data. On the other hand, with the right Enterprise Resource Planning (ERP) system, reporting is quick and easy. Well, you’d be right about ERP reports — with one important exception: Odoo ERP reporting. Odoo is an open source ERP with sleek, modern interface and powerful features that disrupt the traditional ERP industry and provide new ways of managing data. 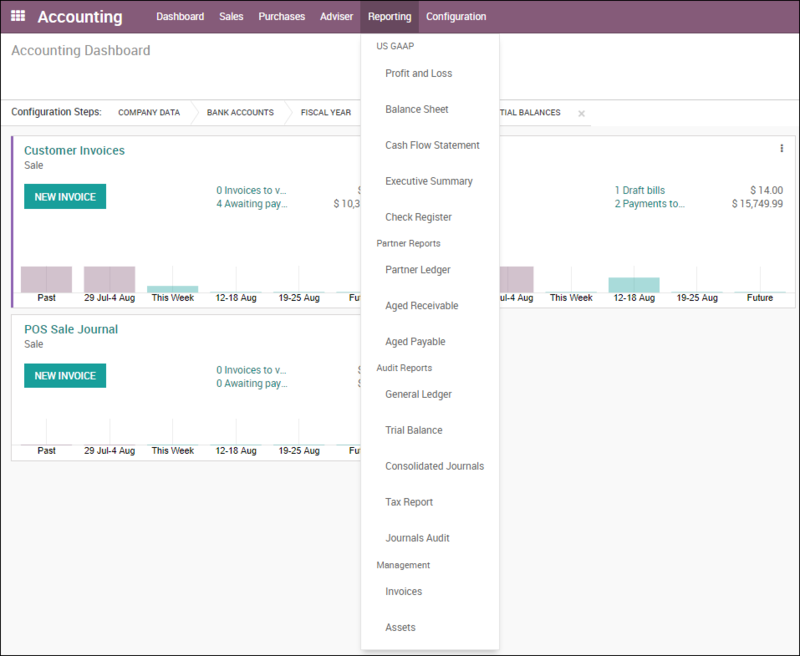 Odoo provides a simple querying tool capable of generating complex reports. You can select any field, or group of fields, from the database and create a report around them; and all within a few seconds. Some days you simply want information with one click of a button. Odoo has you covered there, too. Every module includes a reporting subsection with built-in reports specific for that business sector. If you are used to working with Pivot Tables via spreadsheets, you’ll be right at home with Odoo — minus the cumbersome spreadsheets, that is. With Odoo, you can create your own pivot tables within seconds using, again, any available field from the database. If you still prefer the spreadsheet format, you can stick with it in Odoo. Just export the spreadsheet with a click. For a quick visual snapshot, Odoo offers presentation-style graphs. You can include them in your monthly reporting, board presentations, or simply for a daily visual overview of the data you work with. Of course, Blue Stingray specializes in custom builds of Odoo ERP. If you need specialty reporting functions, we can work with you to make that happen. There are a lot of ways to generate reports in Odoo, and we generally use all of them at Blue Stingray. We won’t go into detail on each individual report here, but we will focus on two profitability reports that we generate and email every day and on a weekly basis. As the name implies, Odoo creates and delivers this report to Blue Stingray management daily. The report includes information from the previous day, such as project hours, employee hours, late tasks, and tasks that are due soon. It provides an overview of the most profitable projects for that day, the number of hours put in by employees toward the billable time, tasks that have fallen behind, and deadlines that are creeping up. This report is a perfect management tool for accessing all the pertinent information on the current state of our operations. Every Monday, Odoo sends out a weekly report that includes information on previous week’s operations, including project hours (for the week), and employee hours (for the week). The report breaks down each project in terms of overall hours, billable hours, and total profitability. The same applies to employee hours. This report provides a great snapshot of each project’s and each employee’s profitability for the week. Aside from being a great tool for management of day-to-day operations, Odoo provides company officials with tools for making long-term plans and decisions. Our clients, many of them large Fortune 100 companies, rave about Odoo and recommend it over legacy ERPs. Are you interested in learning how this amazing software can help you improve your operational and reporting efficiency? Contact us for a free, no-strings-attached demo and we will show you why we are such big fans of Odoo and the ERP’s reporting capabilities.